For many residents, Hanover PA is a place they have always called home, and for others, it’s a convenient place to call home with its proximity to Baltimore and York. Through the years, Hanover has transitioned from a small, quaint town to a place with plenty of activity, history, and shopping. 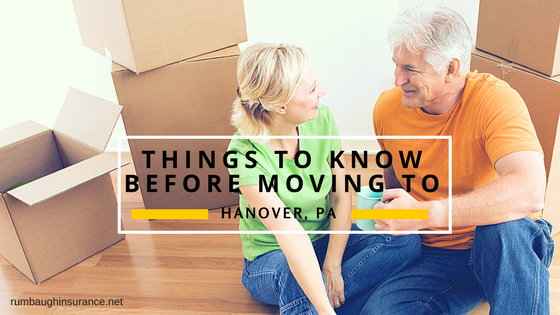 If you are considering moving to the area, we’ve put together a list of things to know including what you should do about your home and auto insurance. The Snack food capital of the U.S.
Hanover, PA is home of Utz Potato Chips, Snyders-Lance, Schultz’s pretzels, and the famous Revonah pretzels. We have been named the snack food capital of the U.S. Just outside of Hanover; you will also find Martin’s potato chips, Hershey chocolates, and Wolfgang Candy. Many of the iconic snack food businesses offer free factory tours to residents and visitors in the area. Even with the growing population, public transportation is limited to Rabbit Transport. To see a full list of bus stop locations including times, visit their website. Codorus State Park offers plenty of activity. Codorus State Park consists of 3,500 acres of trails, scenery, campgrounds, and Lake Marburg. Locals spend their time fishing, picnicking, walking (or riding) the trails and enjoying the lake in warm months. The park also hosts many community events including Codorus Blast, Winterfest, and Halloween in the Park. Downtown Hanover is undergoing an extreme makeover. Over the past few years, downtown Hanover has seen some significant changes with new businesses and a focus to recreate and embrace the heritage once seen there. The first Saturday of every month welcomes visitors with mini-golf, wine tasting, or snacks depending on the monthly theme. Downtown businesses now include local pubs, art studios, and even an olive oil tasting room. Median home prices vary depending on school district. Trying to figure out if you can afford the move? The Hanover Area Chamber of Commerce offers a valuable breakdown of the cost of living in and around the Hanover area. The median home prices range from $124,000 to $165,000 depending on the school district where you purchase a new home. If you are looking to move to Hanover, PA, remember to request quotes for home and car insurance from an independent insurance agency. Independent agents have access to many different carriers and will work with you to find one with comprehensive coverage that fits your new budget.